It’s a 12-day and 11-night motorcycle rally, for 250 CC engines and above, that takes enthusiast and professional riders across borders between Malaysia, Brunei and Indonesia. 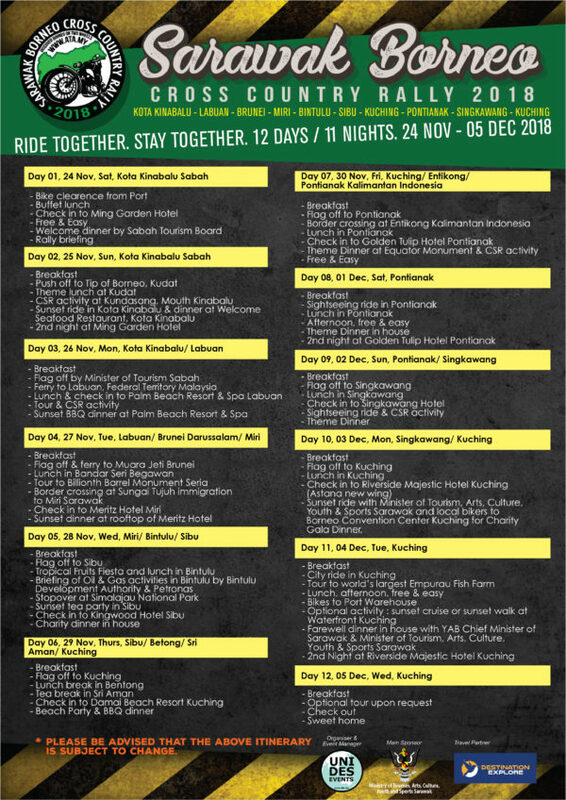 Riders will start off in Kota Kinabalu, Sabah, riding through Bandar Seri Begawan, Brunei, Miri, Bintulu, Sibu and Kuching in Sarawak, to Pontianak and Singkawang in Indonesia and ending in Kuching. The motorcycle rally is estimated to bring together some 200 foreign and local big bikers this year to see what Sarawak and the rest of Borneo has to offer. Normal participation package costs RM4,777 nett which includes, border crossing documentation fees, mobile support trucks and a technical team, meals, three rally t-shirts and one long sleeve dry fit shirt, petrol, mineral water and luggage transportation by coach. The package excludes shipping and air tickets. For bookings, contact 013-3913388, 019 – 2705073 or 012 – 6866550.